To think that the nether licking Feego King is appreciative and emotional. well, there is the theory that momo and co actually come fro mthe past, and momonosuke actually met the real roger because he comes from 20 years ago traveling i nthe future. I’m really confused right now …. What a spoiler…. Oda what ze fuk????? Speed new nakama confirmed? .___. Yeah one that’s now 100% tamed/ submissive. luffy efin speed while holding o tama. 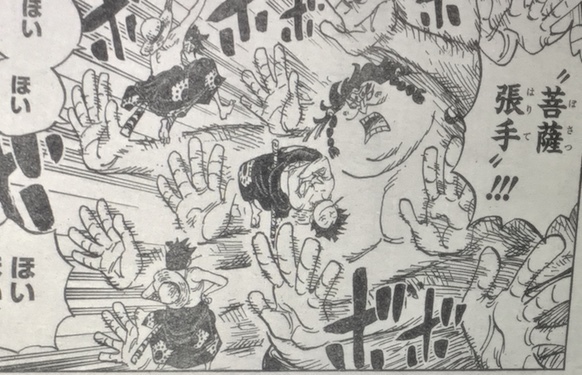 There has to be some admiral lvl fighters in Wano, so far we havent seen that. The sumo wrestler was fodderized quickly. What impressive fighters do Wano have ? They have to be impressive enough to repel a WG assault. I smell another Pell gravestone story. remeber pell was llooking at his grave after the nuke. the wano think momonosuke and co are dead, but they are not. Logically if Momo’s dad died 20 years ago, even if he wasn’t born, he should be at least 20, and it seems like he knew his dad, so older. They are not ghosts they can’t eat devil fruits, or keep their powers after death, 3 of the 4 have known df powers.